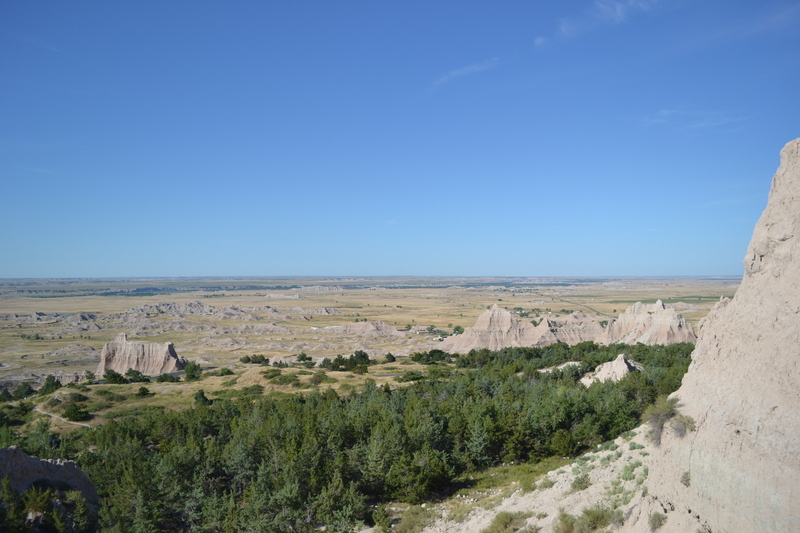 The drive from Teddy Roosevelt National Park in North Dakota to Badlands National Park in South Dakota is not an exciting one. The scenery is boring and repetitive – grasslands and the occasional defunct barn as far as the eye can see. Every once in a while you pass through a tiny isolated town, like New England, N.D., where we bought some lunch groceries, Faith, S.D., where you can get a mean malt at King’s Drive In and Philip, S.D., where we shopped for dinner food. I cannot begin to imagine what life must be like in these places, but none of the adjectives that come to mind are positive. They’re certainly interesting to pass through, though. The more I see of this country, the more perspective I have. We arrived in Badlands National Park around 7pm and quickly headed to the Cedar Pass campsite, where we’d reserved a spot for two nights. The camp spots are close together – there’s no privacy and you better hope your neighbors are quiet – but the backdrop of the rock formations is stunning, and the facilities are good. My husband and I were pleased with our choice. One thing to know about camping in Badlands: there are no fires allowed in the park. So, if you plan to cook food, bring a camping stove. It was the first time we got to bust ours out, and I was glad to finally have a reason to use it! 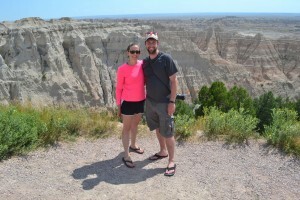 We had allotted one full day in Badlands, so we got started early. Before 10am we already had three trails under our belt: Window, Door and Notch. They’re all pretty short; at 1.5 miles, Notch Trail is the longest and most interesting. It involves climbing a wooden ladder to a higher elevation in the mountains, and at the end a great view awaits. We spotted some wildlife on the trail as well, although maybe not the kind you want to spot. A rattlesnake slithered right between my husband’s feet into a coil at the side of the trail. Later that evening we sat in on a ranger program and learned that only three people in Badlands have ever been bitten by a rattlesnake. Thankfully, he did not become number four. 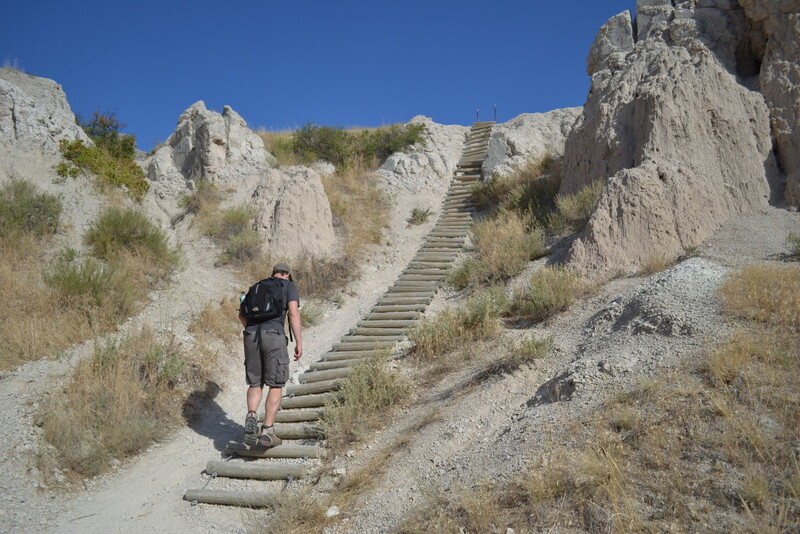 If you’re visiting Badlands during the summer and are up for some hiking, I suggest starting early. By 11am or so the sun was beating down and the temps were above 90 degrees. We set out on Castle Trail, a ten mile round trip trek, around 10:30am, knowing we would come nowhere close to the end. We turned back around the two-mile mark, after we’d made a serious dent in our water supply and were ready to be out of the unrelenting sun. After eating lunch in the shade we sought refuge from the heat in the air-conditioned visitor center, where I watched most of a 20-minute video on the park and, admittedly, slept through the rest. That’s not meant to be a review of the video, more the result of getting up early and being active in the heat. The afternoon was spent driving the scenic loop in the park and taking in some of the vistas along the way. We opted to drive past Pinnacles near the end of the loop, onto the Sage Creek Rim Road, which is where we saw the most wildlife in the park. South Dakota seems to be teaming with prairie dogs – odd little creatures – and bison. On our way back we drove through Wall, South Dakota to pick up dinner supplies and grab an ice cream cone. If you’re in the area, you’ll see signs along the highway advertising the many allures of Wall Drug, one of which is homemade ice cream. Wall Drug, as it turns out, is a funny, stylized old-timey establishment that can only be described as a tourist trap. The ice cream may be homemade, but I’d sooner recommend the Dairy Queen around the corner. 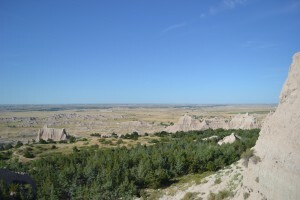 Camping in Badlands was great the first night. We stopped by the amphitheater, walking distance from our campground, for the 8:30pm ranger talk (topics vary nightly), followed by a tour of the summer sky, which was quite enjoyable. The sky was gorgeous, and it was fun to identify the constellations and learn about their origins. On our second night in the park our luck turned and a storm swept through, forcing us to sleep in the car. Certainly not ideal, but we got through it.